“All work and no play makes Jack a dull boy”. This universally known proverb reflects the current scenario of our era. 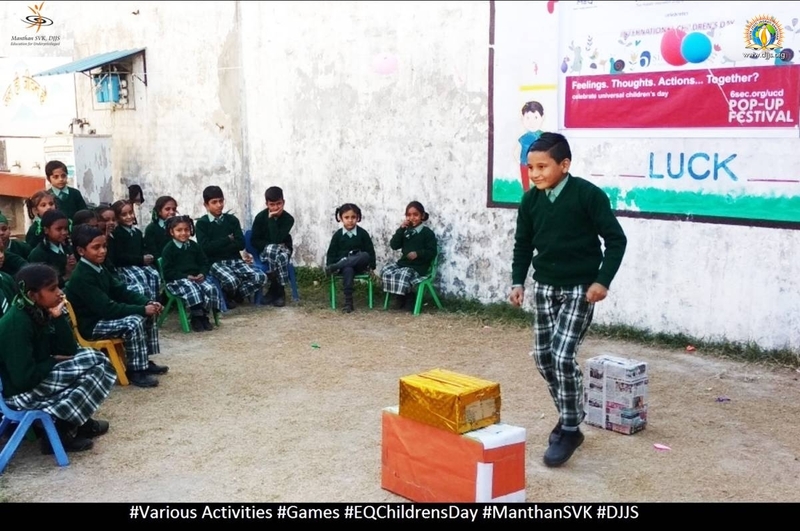 It is clearly known that a child learns far more through games and activities as compared to theoretical sessions. 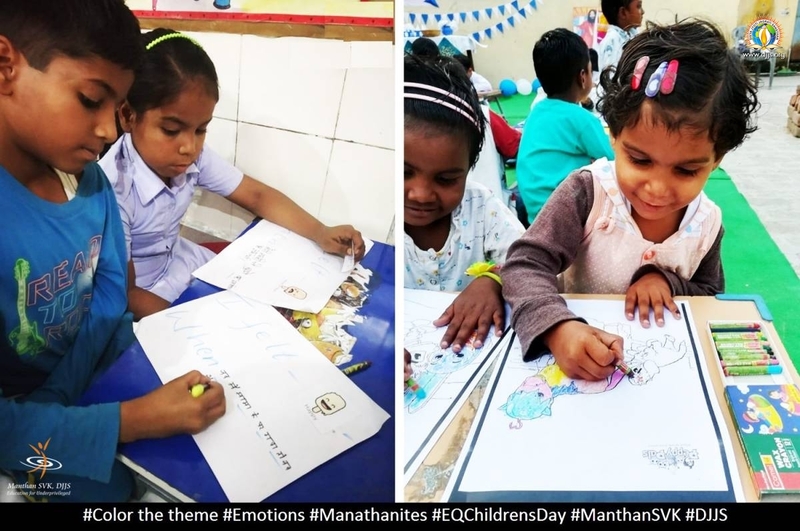 Emotional development of a child is an integral part of his growth. To aid this growth, 20th November is celebrated as UN Universal Children’s Day every year. 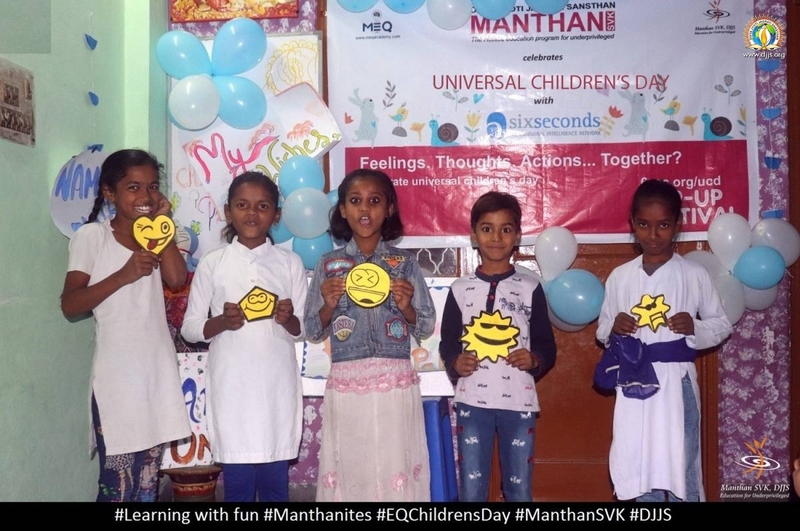 According to the United Nations, the purpose of Universal Children’s day is to encourage people to, “advocate, promote and celebrate children’s rights, translating into dialogues and actions that will build a better world for Children.” This year Manthan SVK was also a part of this worldwide event. 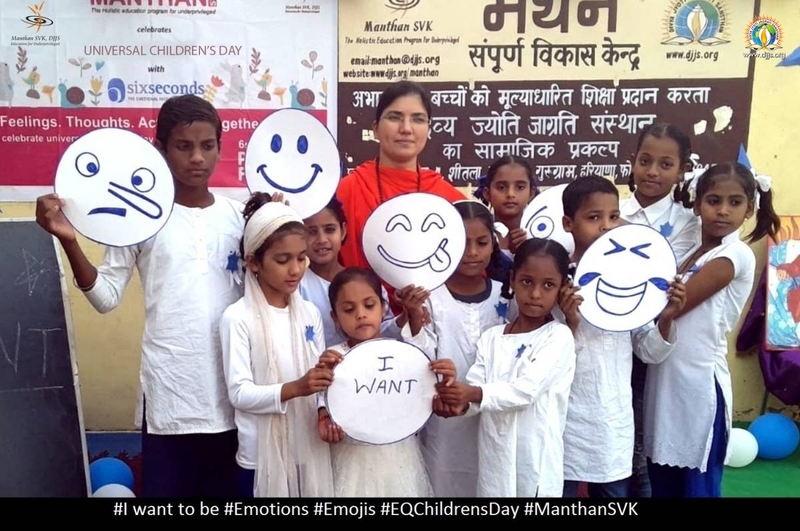 It’s called a POP-UP Festival for emotions, well being, and children’s rights to celebrate U.N. Universal Children’s Day & share love and skills for a better world. 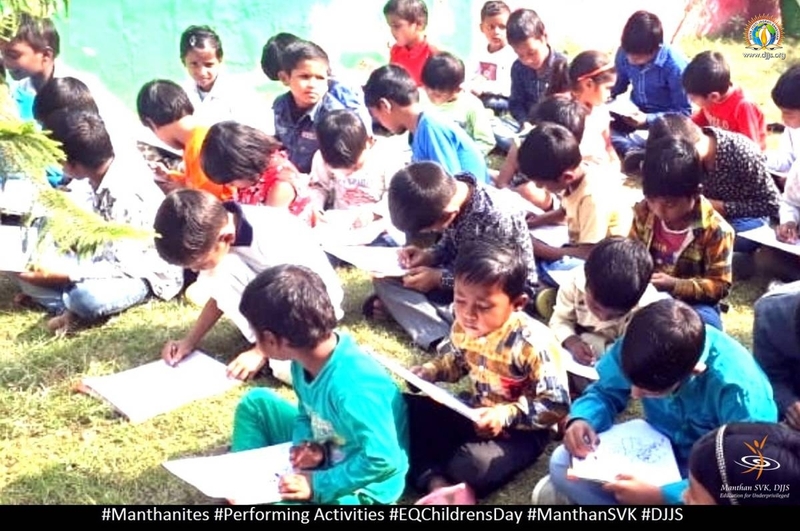 Over 330,000 participants, 1,500 volunteers in 157 countries and 22 partner organizations from around the world were a part of this event, Manthan being one of them with about 500 beneficiary children. 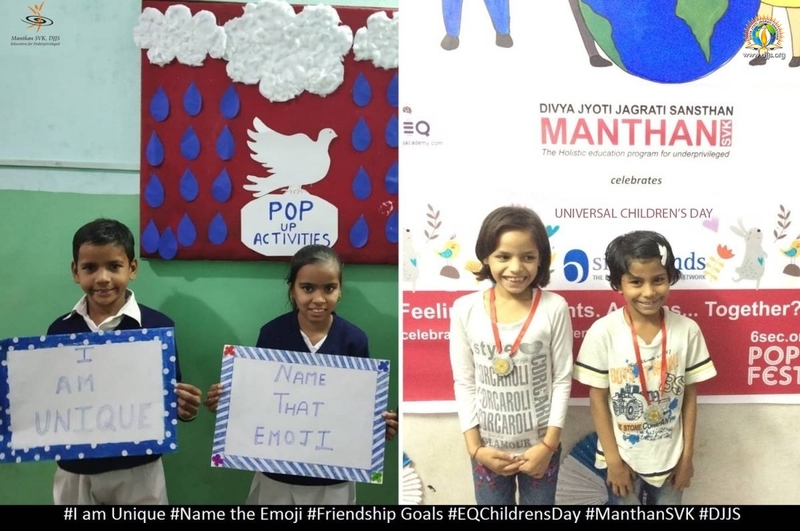 The POP-UP Festival educates and inspires both children & adults to develop and practice emotional intelligence – the learnable, measurable skills that fuel well being and support a world where children’s rights are fully realized. Multiple activities were included in the event. 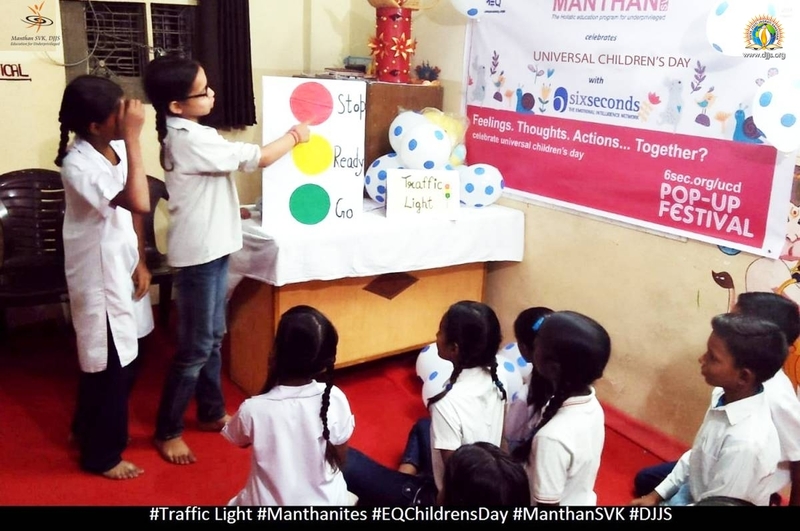 The event took place at all the centers of Manthan SVK with organisation Six Second. 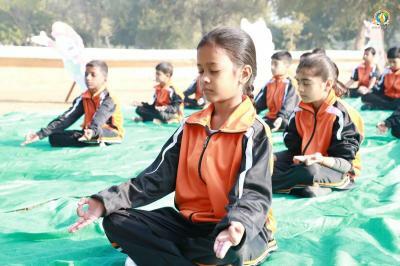 Different activities were arranged for children of different age group. 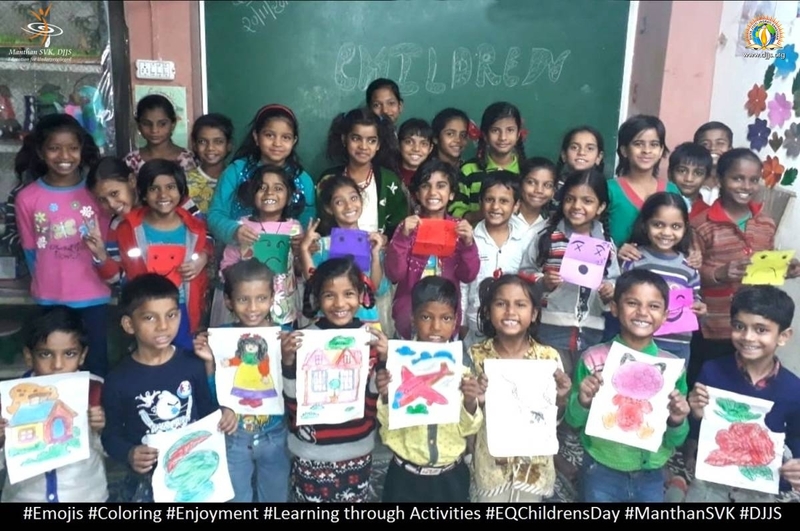 The children of ECE group (Early childhood education) were involved in activities like Peppy Pals Coloring in which the kids were given pictures and were asked to color them. 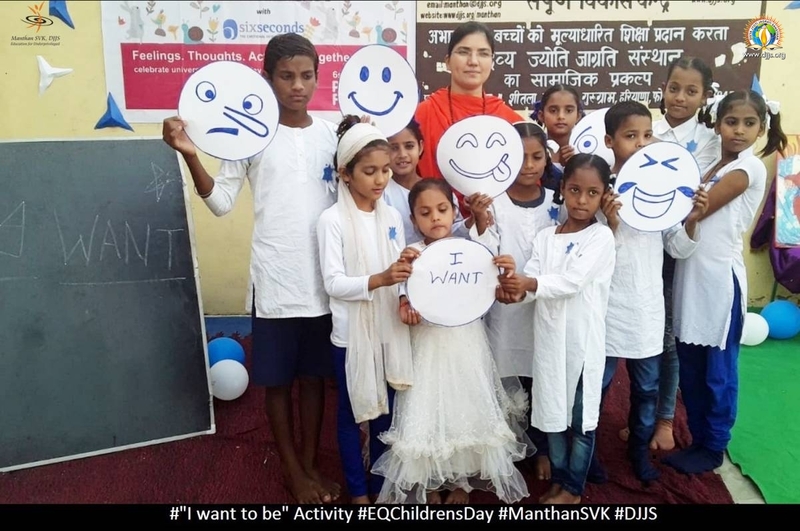 Another activity arranged for these kids was My Wishes. In this activity, kids participated in ola ola game and then were asked to tell their one wish to the whole class. This activity revealed so many naïve and innocent wishes of the kids. Another group of children from class first, second and third had different activities planned for them. Want card revealed the kind of behavior the student expected from their teachers and peers. 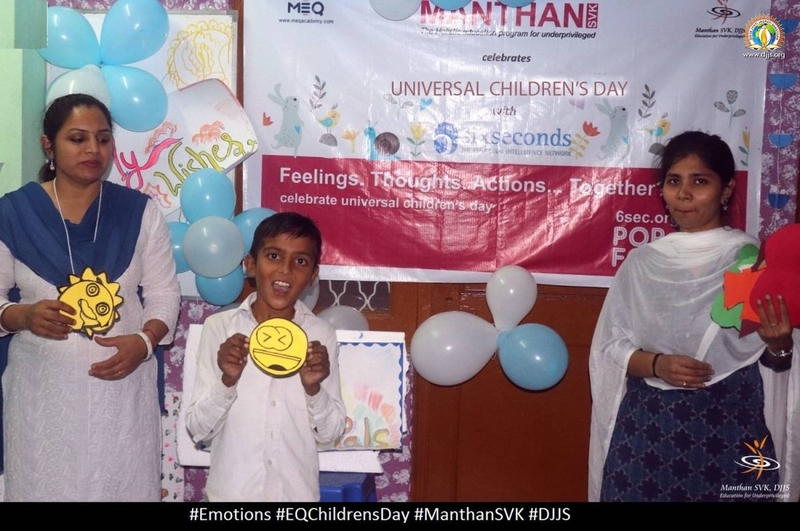 In emoji define feeling, students picked up a emoji picture chit and were asked to tell the instances when they feel that particular emotion. 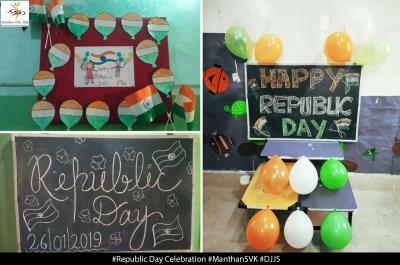 This day acted as friendship day as well, as students were asked to make a medal for their best friend in the classroom. 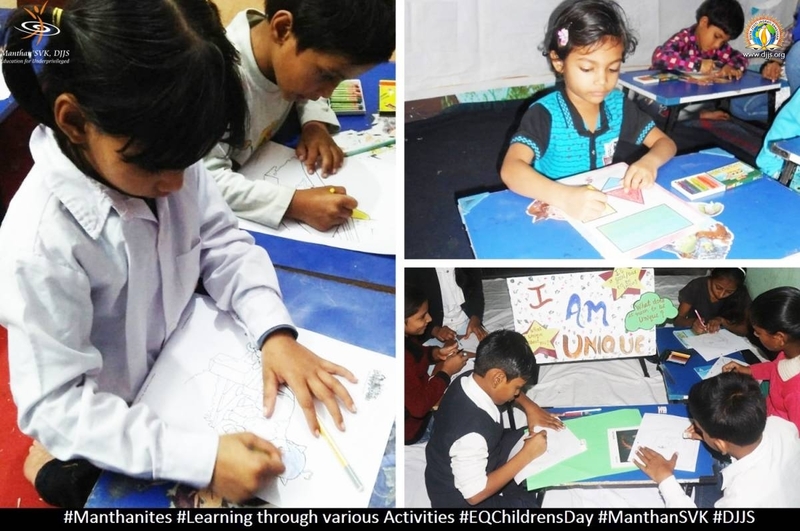 The students of class fourth and fifth had different kinds of activities planned for them. 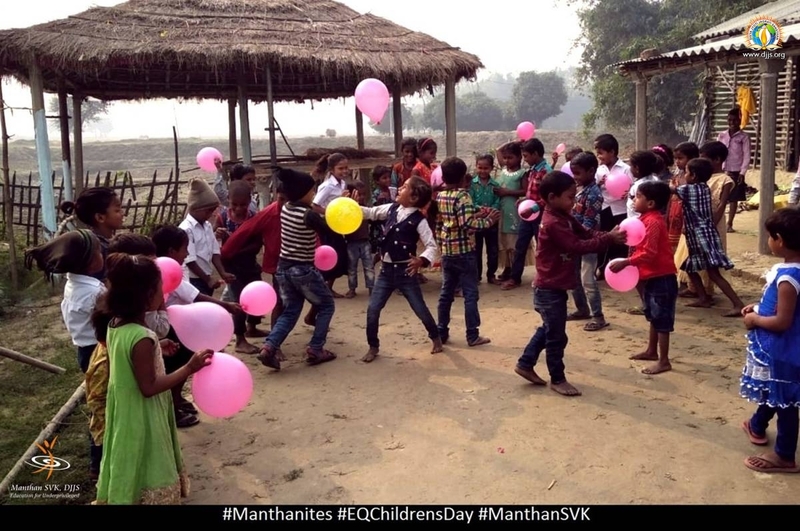 The problem solving ability of the children was also challenged in one of the games called situation game. The students were given a particular situation and were asked to tell how they would solve that problem. Such games really simulate the children's mind. Dreams of a child have the power to change the entire world. 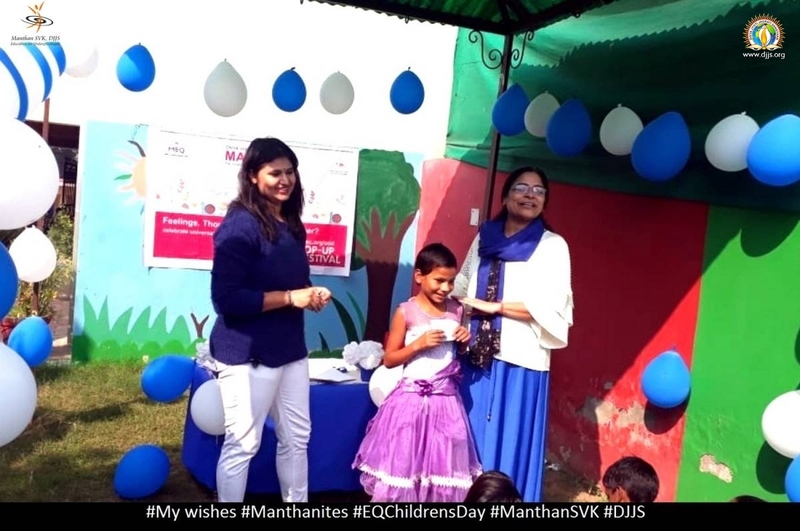 Such dreams were revealed in action card game in which the students opened up with their heart’s desire to change one thing in their life and their action plan behind it. 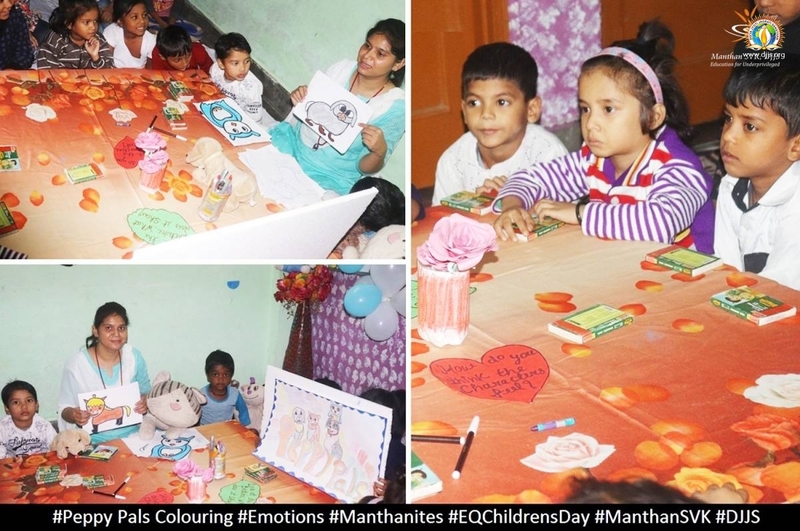 The day was successful in fulfilling its motive of emotional stimulation of the children. 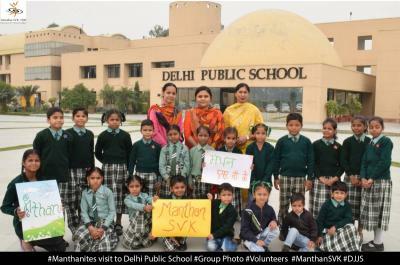 Multiple Manthan volunteers worked to make this day a success. 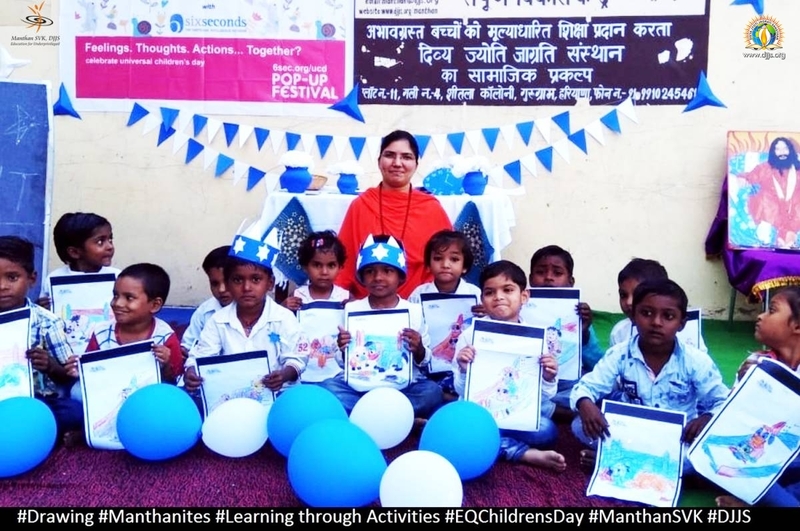 Such events provide a learning environment to the kids and aids in their growth. 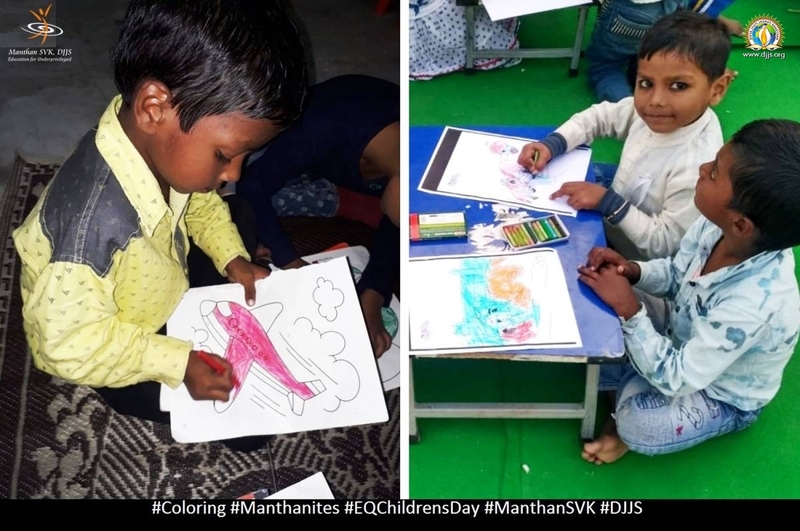 The kids at all the centers of Manthanites SVK benefitted a lot from this event and celebrated the universal children's day with full enthusiasm.